Winding up a long, unwieldy garden hose was once a terrible chore. But not anymore, thanks to the Reel Smart Self-Winding Reel. With the flick of a switch, the Reel Smart hose will put itself away, quicker and neater than you could have yourself. It has a hydraulic motor inside the reel – very small and efficient, that operates on the water pressure inside the hose – no outside power is needed. You can also decide how much of the hose you want to rewind with the on/off lever. There are a number of models available that can hold varying amounts of hose, as well as a range different styles – for example, the Reel Smart Country model comes in a hardwood case, giving a touch of refined elegance. 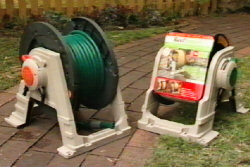 The Reel Smart can be either sat on the ground, or mounted to a wall, ready to suit any backyard. The Reel Smart comes with a full 2 year warranty, plus a 30 day satisfaction guarantee – and they start at just $99.